A working drawing of what the café space will look like as of now. The long-awaited Geisel Library café won’t open its doors until spring 2016, but, already, it’s earned an “A.” But, this “A” is not the coveted grade, it’s for Audrey, specifically Audrey Geisel, the generous benefactor of the UC San Diego Library for whom the new café will be named. Audrey’s is expected to be completed in mid to late spring, with a grand opening planned for the campus and community supporters in May 2016. The café, which has been under construction since last December, is located on the 2nd (main) floor in the East Wing of Geisel Library, conveniently situated on the north end of the building’s most heavily used study area, which also houses the overnight study commons. The café is one of the many enhancements planned for the university’s flagship building over the next several years, thanks to a $3 million gift made by Audrey Geisel in July 2015, which is the lead gift in the Geisel Library Revitalization Initiative, a major endeavor aimed at transforming and rejuvenating the interior public spaces of the library to meet the evolving needs of students, faculty, and other library users in an increasingly digital environment. The café will be operated by the university’s Sports Facilities, which manages Peet’s near RIMAC in the north part of campus. Coffee and tea will be supplied by Café Virtuoso, an independent local roaster, known for its environmentally sustainable products, including certified organic and fair trade coffee and tea. San Diego’s Bread & Cie will provide pastries and other breakfast items; salads and sandwiches will also be provided. “We are excited about our partnership with the Geisel Library and we look forward to assisting in their efforts to enhance an already outstanding learning environment,” said Don Chadwick, Director of Sports Facilities in Student Affairs at UC San Diego. Last year, the Barrio Logan-based Café Virtuoso entered its second straight year of impressive growth, both adding space and tripling its production capacity. Its certified organic coffees have scored in the low- to mid-90s from coffee assessor CoffeeReview.com — placing it among the best independent coffee roasters in the nation. 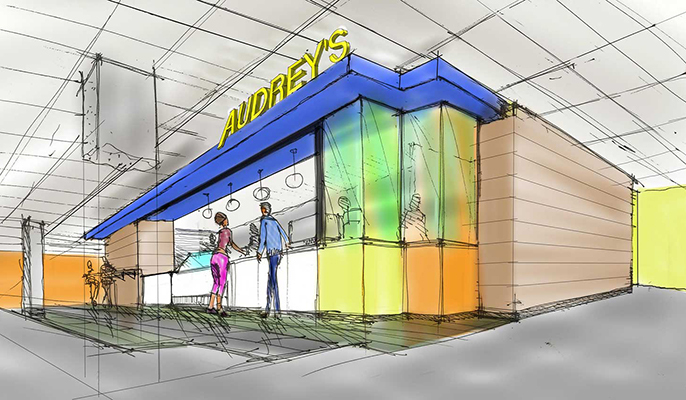 Audrey’s will occupy approximately 3,000 square feet, including an adjoining lounge. The café is expected to provide seating for between 50 and 75 patrons, and will also feature a to-go counter. While café hours are subject to change, Audrey’s will initially be open daily, from 7:30 a.m. to 10 p.m. from Monday to Thursday, with shorter hours over the weekend. The café will stay open until midnight during Finals week and other crunch times. Audrey’s color palette will reflect the colors — shades of yellow, orange and blue — depicted in the bold and much admired Read, Write, Think, Dream art installation created by artist John Baldessari, in the lobby of Geisel Library. The installation is part of the university’s renowned collection of public art, the Stuart Collection. In addition to the café, the Geisel Library Revitalization Initiative will include a wide range of new technology enhancements, as well as new furniture, carpeting and finishes. While Audrey Geisel’s generous gift will support the revitalization of the main floor public spaces, additional funds are needed to support renovation efforts in the public spaces on the 1st and 8th floors of the building. For further information about the Geisel Library Revitalization Initiative, click here or contact Julie Sully, director of development for the library, at jsully@ucsd.edu or (858) 822-4554.